Why don’t more people know about Fredric Brown? I think this is one of life’s greatest mysteries. A master of short stories, ingenious plot devices and twist endings, Brown has been all but forgotten in recent years. For most of his writing career Brown survived by publishing in pulp magazines, inexpensive fiction publications that mainly specialized in genre short fiction throughout the 1940’s and 1950’s. His two areas of focus were science fiction and mystery stories. He proved to be an excellent author in both of these genres, but is probably best known for his mystery work. Oddly enough, he is purported to have strongly disliked writing mysteries and only wrote these short stories and novels to pay the bills. Science fiction, his true love, was not in as high demand as stories starring deadly poison, bloody knives and smoking guns. It can be argued that this difference in demand forged much of his career. Fortunately, Brown’s personal opinion of mystery writing did not negatively affect the quality of his mystery stories. They are fabulous! It seems like the twist ending has become the standard in the past decade or so and more often than not readers or viewers will feel cheated at the conclusion of a mystery because the twist has not been built up with care or believability. This is not the case with Brown’s work and I find it personally shocking that a writer was so adept with the twist ending in the 40’s and 50’s and has since fallen off the face of the publication world. Some publishers such as NESFA Press and Stewart Masters Publishing, LTD. have tried to keep Brown’s legacy alive, but he is still not a regular staple on book store shelves or websites. We need more Freddy Brown! 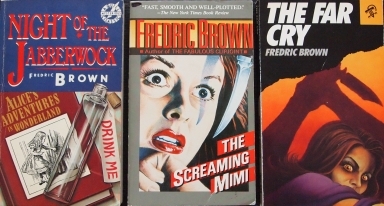 If you’re interested in checking out some of Fredric Brown’s work, Amazon or Abebooks are your best bet, as I have essentially lived in used book stores for the past decade and rarely find a Brown book. I would highly recommend one of the titles depicted above if you can find them, although I should mention that I am partial to Night of the Jabberwock and The Far Cry. The Far Cry in particular will rock your world. Don’t read the synopsis or skim through the pages, just start at page one and enjoy the ride. Attack the Block – Aliens are invading at the Maven, and we love it!